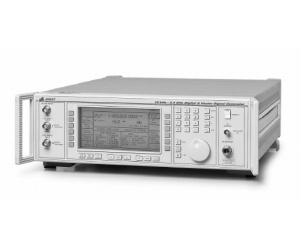 The 2050 series of digital and vector signal generators covers the frequency range 10 kHz to 1.35 GHz (2050), 10 kHz to 2.7 GHz (2051) and 10 kHz to 5.4 GHz (2052). These instruments are suitable for a wide range of applications including the testing of new digital communication systems. The 2050 series signal generators have a large screen dot matrix display with softkey function selection which allows flexibility of operation. Hardkey and data entry key together with a rotary control knob are also provided. The output may be modulated using ΦM, FM, AM, IQ vector or complex digital modulation. Pulse modulation is optional.